The Hoya Con Bio RevLite laser system has rightfully gained a reputation as one of the workhorses of the cosmetic laser industry because of its effectiveness and power in performing a number of different cosmetic laser procedures, including the easy removal of stubborn colored tattoo inks. The reason the Hoya Con Bio RevLite laser equipment is so popular is because it can easily switch between four different wavelengths and various different spot sizes to make it like multiple cosmetic laser machines in one. As an industry leader in the used cosmetic laser equipment market, UsedCosmetic.com can offer you the lowest prices out there on a used Hoya Con Bio RevLite laser machine. Contact us today for a no obligation price quote. When you buy from UsedCosmetic.com, you receive our 100% customer satisfaction guarantee, so you will know without a doubt that you have gotten the best deal around on your purchase of a used Hoya Con Bio RevLite laser system. 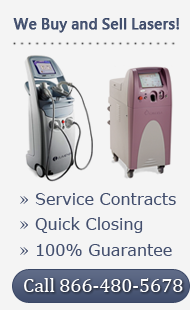 To that end, UsedCosmetic.com also offers no obligation price quotes as well as trusted representatives to answer any questions you may have about the Hoya Con Bio RevLite laser equipment before you purchase it. Find out more by simply submitting your contact information using the form below, and we will get back to you quickly with the answers to all your questions about the Hoya Con Bio RevLite laser system.